With Wawa Energy Solutions Backup Unit, you will never run outof power! Many people think that by using their own solar system or a small wind turbine they will always generate electricity for their own use. Even if the power fails. However, this is not the case. Safety measures ensure that these systems are switched off during a power failure. This means that at that time no energy is generated, even for personal use. Accessibility and availability of computer data are becoming increasingly important. 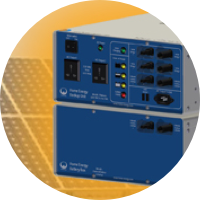 Wawa Energy Solutions Backup Unit prevents data loss on your PCs or servers, and makes it possible to work even when there is a power failure. It is also possible to use with systems for electric cooling such as a refrigerator and a freezer to prevent loss of frozen and cooled products and / or to keep your heating system in operation.